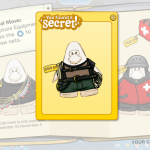 At the Dock, Lighthouse, and Underground EPF Base there was a special catalog where members could purchase several items. One of the items, the Capture Equipment, had a special action during the Blackout where when you throw a snowball, it would throw a net instead. There was one hidden item in this catalog. 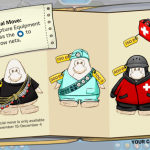 WHEN THE HECK IS HERBERT COMING BACK ANNOYED FACE!!!!!!!!!!!!!!!! !